It was to be expected. Some G20 leaders treated Mohammad bin Salman (MBS) like nothing happened in the kingdom’s Istanbul consulate on October 2. They ignored Riyadh’s genocidal war in Yemen (in cahoots with the US, UAE and other countries), pretending horrendous Saudi domestic human rights abuses and cross-border atrocities are a non-issue. Various world leaders met with MBS on the G20’s sidelines and/or greeted him publicly one-on-one – including Trump, Vladimir Putin, Britain’s Theresa May, France’s Emmanuel Macron, China’s Xi Jinping, India’s Narendra Modi, South Korea’s Moon Jae-in, Mexico’s Enrique Nieto, South Africa’s Cyril Ramaphosa, and perhaps others – eager for Saudi oil, investments, and purchases of what they’re eager to sell the Saudis. Putin’s public greeting of MBS was a disturbing moment, nothing to be proud of, warranting harsh criticism and disdain. Some, maybe most, world leaders in Buenos Aires tried distancing themselves publicly from MBS. For them, he’s an unwelcome skunk at G20 garden party proceedings, sidelined for the family photo, standing at its far edge, who’d be willing to stand next to him, exiting the stage without shaking hands or talking with other leaders when taken. Publicly he stayed largely on the periphery, most leaders likely uncomfortable about being photographed near him, let alone shaking hands and chatting amiably with a universally reviled despot. Vladimir Putin greeted him warmly, caught on camera smiling with a high-five. Sputnik News said their public exchange “st(ole) the show at the G20…the video of their greeting going viral” online. In greeting MBS on Friday, Putin opted for diplomatic graciousness instead of going out of his way to avoid him, the right thing to do, a ruthless tyrant, unaccountable for egregious high crimes – ongoing in Yemen, Syria, domestically and elsewhere while G20 leaders schmoozed in Buenos Aires. France’s Macron acted like Putin and Trump, caught on camera chatting amiably with MBS, others likely doing it more discretely. Realpolitik took precedence over honor and high-mindedness the way it most always does, disturbing scenes caught on camera indelibly etched in my mind, many others likely viewing them with disdain. Ordering Jamal Khashoggi’s murder was a drop in the ocean compared to MBS’ Nuremberg-level crimes in Yemen, Syria, and elsewhere in the region, its support for ISIS and likeminded jihadists, along with notorious domestic human and civil rights abuses – horrific enough to make many world leaders blush. MBS is the Arab world’s most ruthless tyrant, not an issue for Putin, Macron, Trump, and others, greeting him like a close friend, an ordinary guy, far from it. 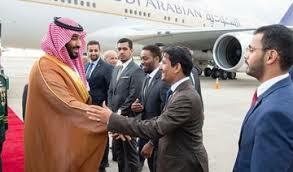 Other leaders were more circumspect, at least publicly, keeping their distance, cordiality with MBS on camera avoided. Behind the scenes it’s another matter for some, meetings held with the crown prince – unannounced or made known in advance. He was sidelined at the official family photo, largely ignored when taken, leaving the scene without shaking hands or other exchanges with G20 leaders. Putin, Macron, Trump, and perhaps several other G20 leaders acted otherwise, caught on camera greeting MBS warmly, a figure to be shunned, rebuked, and held accountable for his high crimes. Putin earlier said he lacked information about the murder, adding he won’t alter bilateral relations with the kingdom over it. Reportedly he met privately with MBS on Saturday. The kingdom repeatedly lied about Khashoggi’s murder before admitting responsibility for what happened. Claiming MBS had nothing to do with it was and remains a bald-faced lie. Riyadh investigating itself assures whitewash and coverup, convenient patsies to take the fall for his crime. For Russia, the US, UK, France, and other countries, continuing dirty business as usual with the kingdom overrides all else. Trump, Putin, and other G20 leaders refused to demand MBS be held accountable for his high crimes – Nuremberg-level ones far worse than Khashoggi’s murder. As the saying goes, when lying with dogs, you get fleas. Treating war criminals like law-abiding figures shares guilt with their high crimes.